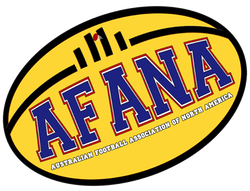 Copyright © 1997-2018 The Australian Football Association of North America. All rights reserved. Redistribution of the content of this site is not allowed except by prior permission except for limited quotes for journalistic purposes only and with proper credit. You cannot forward material from this site to a mailing list, BBS, or listserv without prior permission. You must ask our permission before re-posting the information herein on the web or distributing it via other means. Links back to this site or its content are permitted including links to our RSS feeds and via service links. Any other use, in whole or in part, without prior permission, is prohibited. All trademarks acknowledged. Comments by users are solely their opinions and may not represent the views of AFANA or our advertisers, sponsors, partners, or affiliates. User submissions may be edited or removed for compliance with our terms and conditions. AFANA is an editorially independent organization.